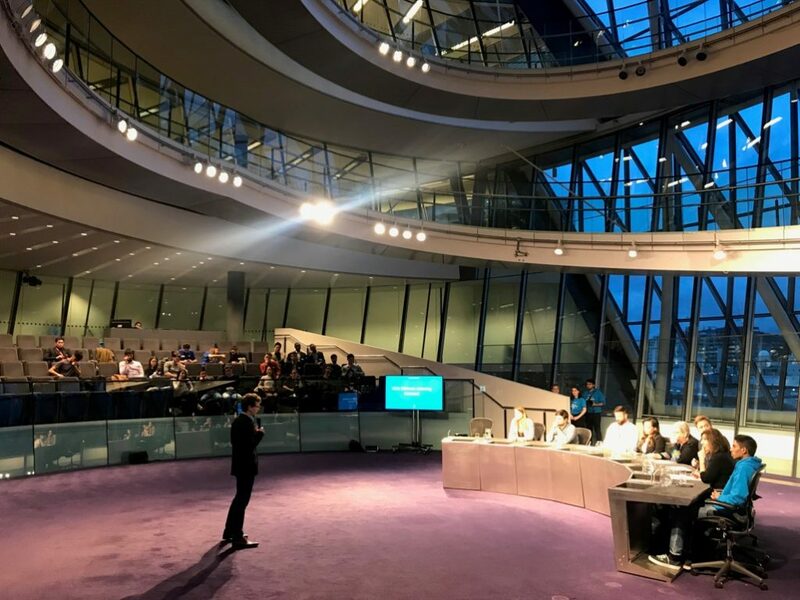 On Friday 15th March I had the honour of participating in the semi-finals of the Mayor’s Entrepreneur 2019 with our Undergraduate final-year project (ULA: Ultimate Listening Assistant)! Being in the top-30 tech projects chosen to progress to the semi-finals out of 625 applications from all London’s Universities (and even start-ups), the stakes (and the stress!) were enormous but it shows how exciting the project we’re doing is – not only to us, but evidently to others as well! I’m happy to tell you I delivered – I strongly believe – the best pitch I ever performed! I pitched about the idea of text transcription and summarization along the normal recording that ULA does and a potential content-sharing platform that could be a business around it (as this is a very entrepreneurial competition). Finally, I must also say I was happy to discover I was one of the youngest among the contestants and the only undergraduate I’m aware of – most of the participates were Postgraduate or PhD students. As you can gather from the above, the competition level was extremely high (I’ve never heard so many amazing tech-product ideas in such a short time!) therefore I won’t be surprised if ULA doesn’t make it to the finals, but nevertheless, I greatly appreciate the distinction of being selected to such an exclusive company with an undergraduate project. Also at the semi-finals was Goldsmiths Computing PhD student Hadeel Ayoub pitching the BrightSign glove – I really hope she reaches the finals because her pitch was seriously amazing! 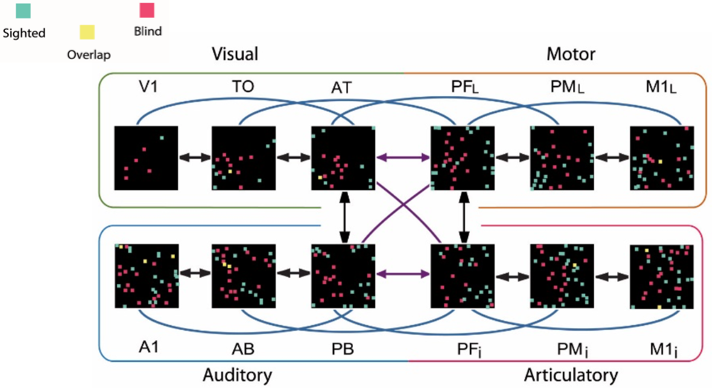 Max Garagnani, lecturer and co-programme leader of Goldsmith’s MSc in Computational Cognitive Neuroscience has co-authored an article recently published in Scientific Reports. You can find the full, open access version here. Dynamic new interactive technology which visualises the 3D structures inside DNA has been launched by a team of computational artists, game developers and scientists, working together to help the public better understand the cause of diseases. CSynth is a software platform created by researchers at Goldsmiths, University of London and Oxford University. Described by its designers as ‘bio-visualisation made interactive’, it shows how cell machinery physically interacts with a structure as complex and compact as the genome. Viewers can watch and explore the 3D models on a screen, or use a Virtual Reality headset to immerse themselves in genetic material and manipulate it themselves. 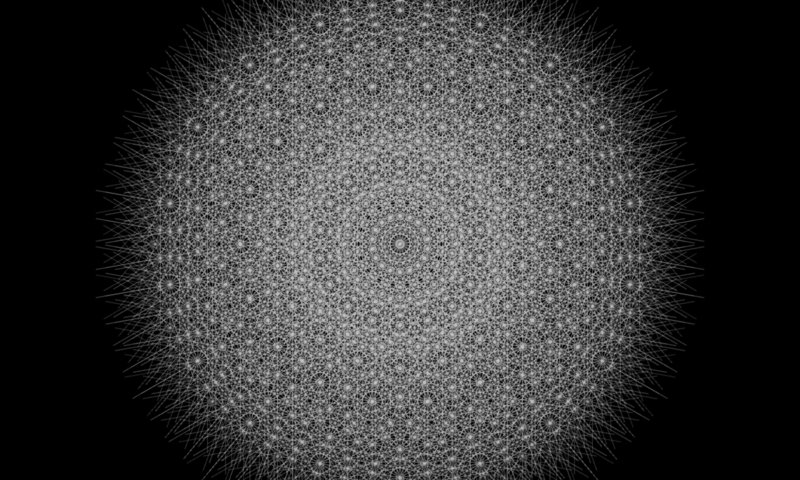 Traditionally, scientists have only been able to visualise and understand the genome – the complete set of genetic material present in a cell – in 2D presentations, on a screen or through graphs or histograms. But as researchers gather more data about how cells work it is clear that a 3D structure is extremely important for gene regulation and how cells differentiate. For example, a white blood cell looks and behaves differently to a red blood cell even though its genome is exactly the same. Subtle differences in the way the genome is folded can impact on whether genes can be switched on and off at particular times, which then dictates what a cell can do. Changes in the way chromatin is folded can cause rare blood diseases, for example, because it impacts on how genetic code is read by a cell. Understanding this process is vital for seeking the cause of diseases such as diabetes or anaemia, and for the development of treatments for them. Thanks to advances in genetic techniques, researchers are able to harness more information than ever before from biological data provided by patients and volunteers. The CSynth software then integrates data from genome sequencing and computer modelling and presents it in an attractive and engaging way, using computer game technology. The team have launched a complete software package that will also allow the import of public data, and help both the public and medical researchers gain a better understanding of how the genome is folded in a cell, and the complex mechanisms involved. Professor Frederic Fol Leymarie and Professor William Latham from the Department of Computing at Goldsmiths are the computer artists and software designers behind CSynth, working with Steve Taylor, Head of Analysis, Visualisation and Informatics at the WIMM Centre of Computational Biology, and Professor Jim Hughes at the MRC Weatherall Institute of Molecular Medicine, University of Oxford. They are joined by Professor Stephen Todd, lead software architect at London Geometry Ltd and Visiting Professor in Computing at Goldsmiths, and Peter Todd, senior developer, London Geometry Ltd. Professor Fol Leymarie said: “Our body is made of trillions of cells, each one containing chromatin tightly folded. This very long molecular strand is not static, but rather keeps moving, vibrating, unfolding and refolding locally, more like a molecular dance. Visit www.csynth.org or read the paper CSynth: A Dynamic Modelling and Visualisation Tool for 3D Chromatin Structure on the open access bioRxiv platform for more information. Virtual Reality is a big part of what we do at Goldsmiths Computing. Our research in VR ranges from visual art to bioscience and medical education. We have developed a worldwide online course on VR and this autumn we will be launching our new Masters in Virtual & Augmented Reality. VR is also popular with our undergraduate students. Last term our third years did our module 3D Virtual Environments and Animation, which includes VR development. They were the first students to use our newly refurbished VR lab which includes Oculus Rifts, HTC VIVEs, Oculus Go and Acer Windows Mixed Reality. At the end of term, they presented their projects for the module. 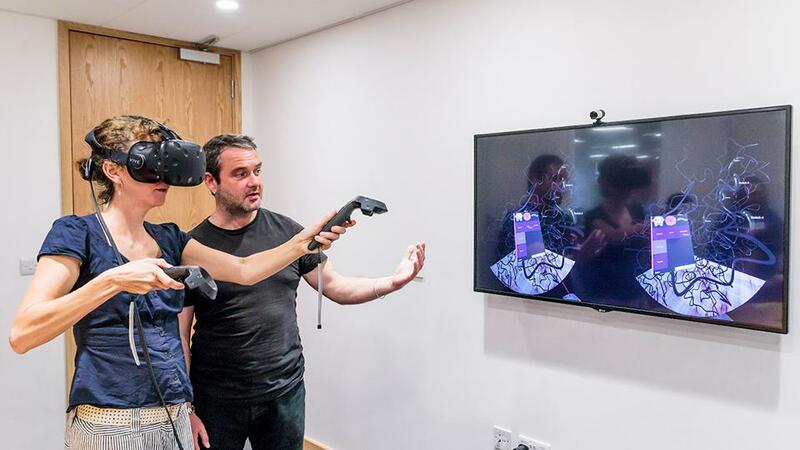 There was a really wide range of fantastic VR experiences, from fairground games, to virtual bar-tending and therapy for fear of heights to virtual photography. If you are interested in finding out more, Marco Gillies, the course leader, has published a longer post that describes all of the projects. A smart glove designed by a Goldsmiths, University of London student has received a top prize at Santander’s annual ceremony for student entrepreneurs. 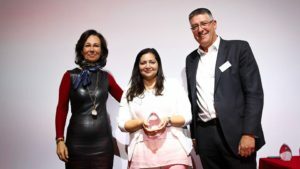 B rightSign Glove, which translates hand gestures into speech and text, won the People’s Choice audience vote at the Santander Universities Entrepreneurship Awards. Hadeel Ayoub, PhD candidate in the Department of Computing, began developing the glove four years ago during her MA Computational Arts at Goldsmiths, and has since attracted international media attention and a raft of technology awards. The glove is equipped with multiple sensors and machine learning software to enable individuals who use sign language as their primary language to communicate through text or digital voice directly, without the need for a translator. BrightSign Glove was voted by the audience at the Santander awards event as having the greatest social, community, and environmental impact, and won a prize of £7,500. Goldsmiths MA Social Entrepreneurship student Jack O’Donoghue from the Institute of Creative and Cultural Entrepreneurship was a runner up, having reached the Santander finals with his project ‘Of The Ilk’ – an organic cotton-based re-usable food wrapping developed as an alternative to cling-film. Hadeel and her development team aim to make BrightSign available to everyone who needs it, at an accessible price. The product is still in development, and eagerly awaited by a fast-growing list of schools and parents. With 70 million sign language users globally, and 90% of deaf children being born to hearing parents, the glove has the potential to revolutionise communication across barriers. Santander Universities Entrepreneurship winners were announced by Nathan Bostock, CEO of Santander UK, and received their awards from Ana Botín, Group Executive Chair, Santander Group. Dr Marco Gillies, Reader in Computing at Goldsmiths, gave a talk at the Virtual and Augmented Reality to Enhance Learning and Teaching in Higher Education Conference, that explained how virtual reality, and particularly interactive virtual characters, could enable us to learn the kinds of social skills that we need for work. These are the kinds of skills that are so hard to learn in a traditional way, anything from a doctor breaking bad news to a patient to a police officer interviewing a suspect. Professional social skills of this type are very different from our ordinary social lives, and handling them well can only be learned through experience. Together with Dr Sylvia Pan, Lecturer in Computing at Goldsmiths, Marco has over 20 years experience of developing animated interactive characters that have realistic body language. Encountering a life-sized virtual human in immersive VR is a really powerful experience because body language cues like eye contact or personal space feel very realistic in VR. Making eye contact on a traditional computer just means looking out of the screen, but in VR it feels like eye contact in real life. That means that a VR conversation feels real. We can use this type of realistic social interaction to help train people to be better at their professional social skills. The conference as a whole included many examples of how VR could be used to teach skills that you can only learn by experience. VR is much cheaper and safer than doing things for real, but much closer to real life than a book or video. In the next few years we will probably see a revolution in immersive media for education, and no where is this going to be more beneficial than in one of the most important skills we need in life: how to interact with other people. 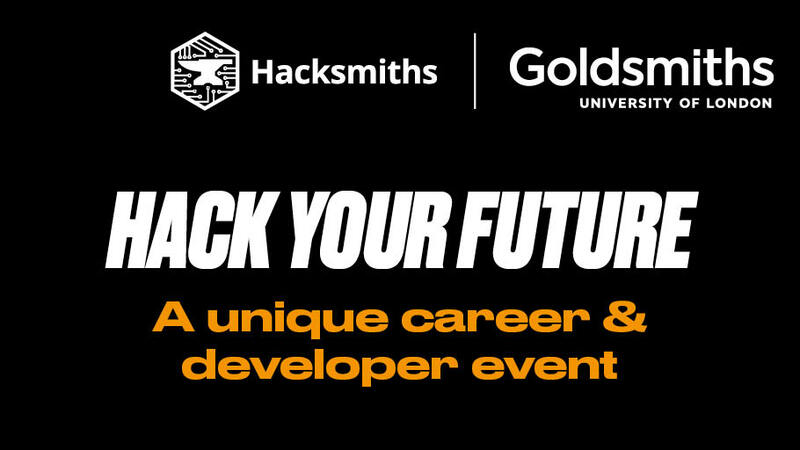 This is the blog for Goldsmiths' Department of Computing.